It’s no surprise that top-ranked Alabama is once again the class of the Southeastern Conference halfway through the season. And considering his ample talent, the emergence of Tide quarterback Tua Tagovailoa as an offensive force could have been easily predicted. 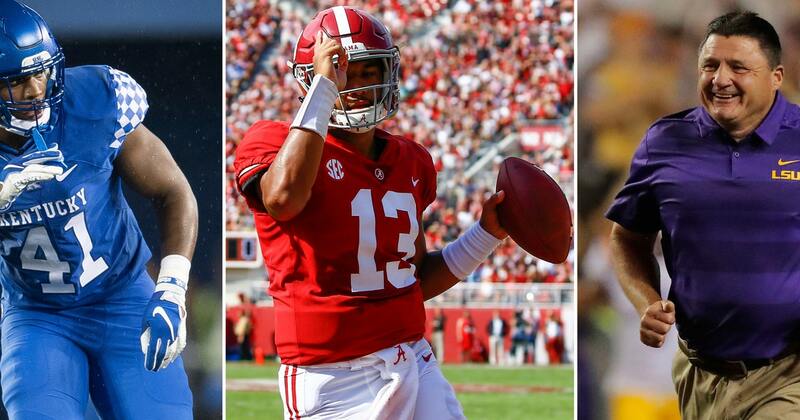 The rest of the SEC has produced a myriad of surprises, superlatives and disappointments through the season’s first seven weeks. No. 5 LSU in very much in the national conversation under coach Ed Orgeron, Kentucky’s program has taken a big step forward thanks to stars like Benny Snell and Josh Allen and Auburn’s 4-3 start to the season has been a huge disappointment. Here are some of the standouts from the first half of the season in midseason voting by Associated Press writers who cover the 14 SEC schools in 11 states. The barrel-chested Orgeron has surpassed all preseason expectations and built LSU into a powerhouse during his second full season with the program. The Tigers already have wins over Miami, Auburn and Georgia and a potential huge matchup with No. 1 Alabama looms in the near future. Orgeron’s defense has been very good as expected, but it’s the development of the offense under transfer quarterback Joe Burrow that’s vaulted LSU into the league’s elite. Also receiving votes: Alabama’s Nick Saban, Kentucky’s Mark Stoops. Tagovailoa has been so good through seven games that it’s easy to wonder if this Alabama team will end up being the best of Nick Saban’s current dynasty. The sophomore’s statistics are staggering: He’s completing nearly 72 percent of his passes for 1,760 yards, 21 touchdowns and zero interceptions. Those numbers would be even better if he played more, which hasn’t been necessary because Alabama’s opened up huge early leads in most games. Also receiving votes: No one. Tagovailoa’s been that good. Allen is a 6-foot-5, 260-pound disruptive force who can harass quarterbacks, stop ball carriers and defend the pass. There’s no telling where the Wildcats would be without his do-it-all presence. He has 37 tackles and leads the SEC with 10½ tackles for a loss, including six sacks. He also has five quarterback hurries and two forced fumbles. Also receiving votes: LSU’s Grant Delpit and Devin White, Georgia’s Deandre Baker and Mississippi State’s Montez Sweat. The latest in a long line of Alabama playmakers is Waddle, who has quickly turned into an important player in the Tide’s offense and special teams. He’s fourth on the team with 17 catches for 340 yards and two touchdowns. He’s also gained 200 yards as a punt returner and scored a touchdown. Also receiving votes: Florida kicker Evan McPherson. The 14th-ranked Wildcats have emerged as a contender in the SEC’s Eastern Division and have a 5-1 record at the halfway point. It took coach Mark Stoops a while to build his program, but in his sixth season Kentucky won its first five games, including breaking a 31-game losing streak against Florida. Kentucky has one of the league’s best running backs in Snell and one of the nation’s best defensive players in Allen. Mond was an intriguing, but inconsistent player during his first season at Texas A&M. Under new coach Jimbo Fisher, the sophomore has turned into one of the league’s best quarterbacks. He’s completing nearly 62 percent of his passes for 1,800 yards, 10 touchdowns and five interceptions. It’s a big reason Texas A&M is the nation’s 17th-ranked team. Also receiving votes: Several others, including LSU kicker Cole Tracy and Kentucky’s Snell. Auburn’s year started with promise after a hard-fought win over Washington, but coach Gus Malzahn’s program has taken a big fall since that point. The Tigers have lost three of their last five games, including a stunning 30-24 home loss to Tennessee last weekend. A program that had aspirations of an SEC title is nowhere near that level and still has to play Texas A&M, Georgia and Alabama. Also receiving votes: South Carolina. Auburn’s problems aren’t all Stidham’s fault, but there’s no doubt more was expected from the veteran quarterback. Following a stellar season as a sophomore, he’s barely completing 60 percent of his passes and ranks seventh in the league with 214 yards passing per game. Also receiving votes: South Carolina quarterback Jake Bentley.